We have a large selection of different USB Flash Drives or Memory Sticks here at C L Promotions and our Personalised Slim flash band USB lanyard is one of our most popular items. With this product you have the added value of the very handy lanyard, housing a 128mb USB Flash-Drive with plenty of room to have your business details and company logo printed onto. So advertise your business details on our Personalised Slim flash band USB lanyards today. Print area: 90 x 8mm. Max diameter: 75 x 210mm. 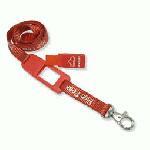 Other promotional and personalised items besides our Personalised Slim flash band USB lanyard click here. To find out more about our Personalised Slim flash band USB lanyard click here and fill in the contact form and we'll get straight back to you.